This tiny golden-crowned kinglet barely pauses as it flits among the branches in its search for food in the trees near the Charm Bracelet trail at Hoccomocco Pond. Both males and females wear golden crowns, but only males - like this one - have a red stripe down the middle of their golden crown. During school vacation week, some Westborough residents escape our wintry weather by going south like the birds. But for certain tiny birds in our woods, going south for the winter means coming to Westborough. 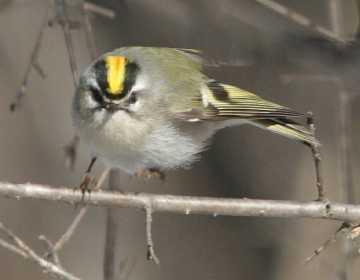 Golden-crowned kinglets (Regulus satrapa) are not our only winter birds, but they're definitely our smallest. Measuring 3-1/2 inches long with a wing span of 7 inches and the weight of a couple of pennies, they are only slightly larger than hummingbirds. But unlike ruby-throated hummingbirds (Archilochus colubris), which avoid the cold by migrating to Mexico or Central and South America (and in some cases flying nonstop across the Caribbean Sea), golden-crowned kinglets simply leave their summer homes in northern New England and Canada for more southerly parts of the United States. For some kinglets, that means Westborough. These tiny birds expend their energy trying to stay warm here, rather than flying to a place that's really warm. A kinglet that you might spot in our winter woods doesn't look small and sleek like a hummingbird. Instead it looks fluffy, fat, and round, more like a small chickadee. That's not too surprising, because like so many other birds in winter, it fluffs out its feathers and down to trap body heat and keep warm. About 80 percent of its feathers (by weight) serve for insulation rather than flight. If you catch sight of the gold patch on top of the little bird's head, you'll know why it's called "golden-crowned" and named a "kinglet". Males have a narrow stripe of red feathers in the middle of their golden crown, and they raise this red patch when they're excited. Overall, kinglets are drab olive-colored and blend in well with their surroundings. Are these little kings likely to appear at your bird feeder? Probably not. They eat insects, which isn't hard to do in spring and summer, especially in their northern summer homes where insects abound at those times of year. (Think of black fly season in northern New England, or clouds of gnats.) But unlike insect-eating birds that also consume seeds and fruit in the winter (such as chickadees, nuthatches, and even bluebirds), kinglets continue to feed on insects throughout the winter. How do they manage to do that? Each day kinglets must put on fat to burn overnight to keep warm. They spend their days in motion, flitting from branch to branch as they pick tiny insect eggs and dormant spiders and mites from the trees. They also feast on frozen, dormant moth caterpillars – inch worms – that they find in cracks in bark and among pine and spruce needles. Kinglets are constantly on the go yet seem almost tame. Sometimes you can get as close as 10 feet to them. You can find them in wooded areas of Westborough that have evergreen trees, including Bowman Street Conservation Area, Headwaters Conservation Area, and the Charm Bracelet trail at Hoccomocco (across from the train station). To look for kinglets, check places with pines or spruce and perhaps aspen. These types of trees are typical of the northern woods where kinglets spend the rest of the year. The little birds find food and protection among them. Areas with young white pines with branches at the level of the trail are promising places to look. The kinglets' calls, which are so high and faint that you can barely hear them, can be a clue that they're around. Kinglets often forage in small flocks of 5 to 8 birds, calling to keep track of one another. You might also find a pair in a mixed flock of chickadees and an occasional nuthatch, titmouse, or downy woodpecker. What else do kinglets do to stay warm - and alive - throughout cold winter nights and stormy winter days? That's a good question, and perhaps one that scientists haven't answered fully. Not only do the little birds burn the fat that they've put on during the day, but they also huddle together during the night, sharing their body warmth, as many birds - including bluebirds - do. They also seek sheltered areas and may even burrow under the snow that cakes on evergreen branches, keeping warm in tiny snow caves. In spite of their efforts, many kinglets die over the winter. By some estimates, at least 4 out 5 don't survive the winter. At that rate, why don't they die out? Their trick is to produce large numbers of young. Golden-crowned kinglets lay eight to11 eggs, about twice the number that many of our other songbirds lay. They pile all these eggs in a double layer in their nests. Some kinglet pairs raise two broods per season. The female starts a second nest while the male continues to feed the young that have recently left the first nest (as some other birds besides kinglets also do). The golden-crowned kinglets that winter in Westborough will most likely nest elsewhere. By April they'll leave to spend the breeding season in places such as Vermont, New Hampshire, Maine, and Canada, where they can nourish their young on the bonanza of insects there. But in April and May, other golden-crowned kinglets may be passing through, journeying back north. At that time, we might also see a different kinglet. Ruby-crowned kinglets (Regulus calendula) will be traveling from southern states back to their northern breeding grounds. Male ruby-crowned kinglets have bright red crown patches that are usually out of sight, and the females have none at all. Golden-crowned kinglets may not join the winter flocks of dark-eyed juncos (Junco hyemalis) at our bird feeders, and they can be hard to spot in our woods. But even when we don't see them, it's fun to know that they're out there.